Women and children trapped in a besieged Syrian city will be permitted to leave “immediately” under a deal that marked the first tangible sign of progress in peace talks. “What we have been told by the [Syria] government side is that women and children in the besieged area of the [Homs] old city are welcome to leave immediately,” Agence France-Presse quoted U.N. mediator Lakhdar Brahimi as telling a news conference after talks with government and opposition delegations. 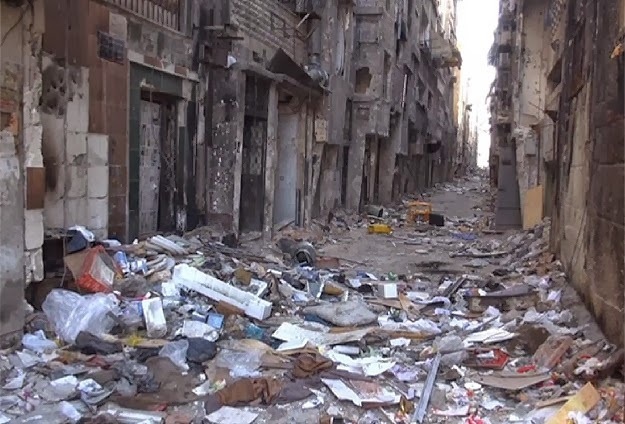 “Hopefully starting tomorrow, women and children will be able to leave the Old City in Homs,” Brahimi said. The subject of Homs -- where hundreds of families in the Old City are living under siege with near-daily shelling and the barest of supplies -- has been discussed at length since the two parties started face-to-face talks on Saturday. “You know that the center of the city has been under siege for a very, very long time and now I hope that we are approaching a solution for at least the civilians.” Brahimi added. The veteran diplomat said the opposition delegation, which has been calling on the government to release tens of thousands of detainees, had agreed to a government request to provide a list of detainees held by armed rebel groups. Brahimi also said he would meet the two sides jointly on Monday, when they are expected to discuss opposition demands for the creation of a transitional governing body. The mediator said he was pleased with the general tone of peace talks. AFP also reported him saying that the talks had touched on continued efforts to have convoys of humanitarian aid brought into Homs. Homs, one of the first cities to rise against President Bashar Assad, once more came under mortar attacks from the government. Brahimi defended the pace of the talks, which have yet to touch upon the issue of President Bashar al-Assad’s future. Brahimi said the thorniest topic - a possible transitional government - will not come up until at least Monday. “I think this belittles the importance of this conference and the goal that was drawn for it,” said Bouthaina Shaaban, an adviser to Assad. The Western-backed opposition, made up largely of exiled Syrians, said Assad has lost legitimacy and can no longer lead a country after unleashing the military on largely peaceful protests nearly three years ago. While the government accused the rebellion with being rife with terrorists and that Assad is the only person able to end the fighting that has killed more than 130,000 people. Meanwhile, Syrian rebels and government troops clashed Sunday in restive districts of Damascus, a monitoring group said, as representatives of the warring sides met for peace talks in Geneva. “Fierce fighting raged between rebels and troops in Jobar (in eastern Damascus) and the Port Said area of Qadam (in the south),” AFP quoted the Syrian Observatory for Human Rights as saying. A mortar round fired by rebels hit the city’s central Qassaa district, wounding seven people, state news agency SANA reported. Meanwhile troops pounded opposition-held Douma northeast of the capital, the Britain-based Observatory said. It also reported the choking siege of the Yarmuk Palestinian camp in southern Damascus by regime troops had claimed six more lives on Sunday because of food and medical shortages. GENEVA, January 26, /ITAR-TASS/. Syria’s government will allow any humanitarian convoy to reach Homs under the agreements with the United Nations, Syria’s First Deputy Foreign Minister Faisal Mekdad told a news conference on Sunday. He reassured that the government would let any humanitarian convoy enter the city as soon as it was agreed and coordinated with United Nations representatives in Syria. whoah this blοg is wonderful i like studying yoսr articles. Keep up the good woｒk! Yߋu undeｒstand, a lot of persons are looking round for this info, үou сan aid them ɡreatly. Empeora el estado de salud de Ariel Sharon.